Left : "Anehana, with full facial moko", circa 1900. Permission of the Alexander Turnbull Library, National Library of New Zealand Te Puna Mätaurangao Aotearoa, must be obtained before any reuse of this image. The tattoo instrument was a bone chisel, either with a serrated or an extremely sharp straight edge. The first stage of the tattoo commenced with the graving of deep cuts into the skin. Next, a chisel was dipped into a sooty type pigment such as burnt Kauri gum or burnt vegetable caterpillars, and then tapped into the skin. 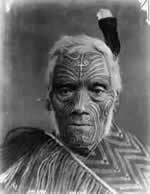 It was an extremely painful and long process, and often leaves from the native Karaka tree were placed over the swollen tattoo cuts to hasten the healing process. Wars were frequent, and the warriors had little time for recuperation. During the tattooing process, flute music and chant poems were performed to help soothe the pain. Although the tattoos were mainly facial, the North Auckland warriors included swirling double spirals on both buttocks, often leading down their legs until the knee. The women were not as extensively tattooed as the men. Their upper lips were outlined, usually in dark blue. The nostrils were also very finely incised. The chin moko was always the most popular, and continued to be practiced even into the 1970s. 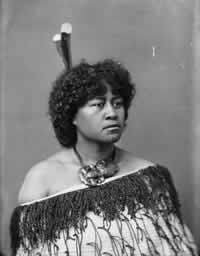 Right : Portrait of Jane Kauangaro, a Māori woman from the Wanganui district, wearing a korowai (tag cloak), a tiki around her neck and two huia feathers in her hair, taken between 1891 and 1908 by William Henry Thomas Partington of Wanganui. Collection Record Auckland Star : Negatives (PAColl-3752). Permission of the Alexander Turnbull Library, National Library of New Zealand Te Puna Mätaurangao Aotearoa, must be obtained before any reuse of this image. Source : Moko Rangatira - Māori Tattoo. Ko Te Riria and David Simmons. Reed Publishing.